Well, you might not be fortunate enough to have Ms. Winfrey as one of your dinner guests, but my point is that you don't have to serve beef to your guests or your family to make them happy. Texans, like everybody else, love chicken. They like it fried, barbecued, roasted, broiled, grilled and stewed. And they like it cooked up with delicious vegetables, succulent sauces and savory spices in company casseroles. Our featured dishes are two casseroles: an elegant Chicken Spaghetti Supreme and a "from scratch" version of the enduringly popular King Ranch Chicken, as well as a time-honored favorite that has graced both dinner and supper tables for generations, Chicken and Dumplings. Casseroles lend themselves well to both company and family cooking. Both our featured casseroles freeze well, so they may be made in advance, and if you are lucky enough to have leftovers, they warm up beautifully the next day. It is also worth mentioning that a good casserole can make a chicken go a long way. If you've never boned a hen before, there's nothing to it really. It's tedious, but the job will go quickly if you have a helper or even someone to chat with. And you can cook and bone the hen a day or two in advance to simplify matters. Each of our featured chicken recipes benefits from containing meat from the whole chicken, both light and dark. If you had planned to use boneless chicken breasts, I encourage you to rethink your plan. Our recipe for Chicken Spaghetti Supreme makes enough for a crowd. The cook has the option of dividing it into two casseroles, one to serve now and one to freeze. This dish is rich and satisfying. The flavors of the varied ingredients meld wonderfully to give culinary proof to the whole being greater than the sum of its parts. This dish is loved by men, women and children and, served with a green salad and some good bread, is a complete meal. 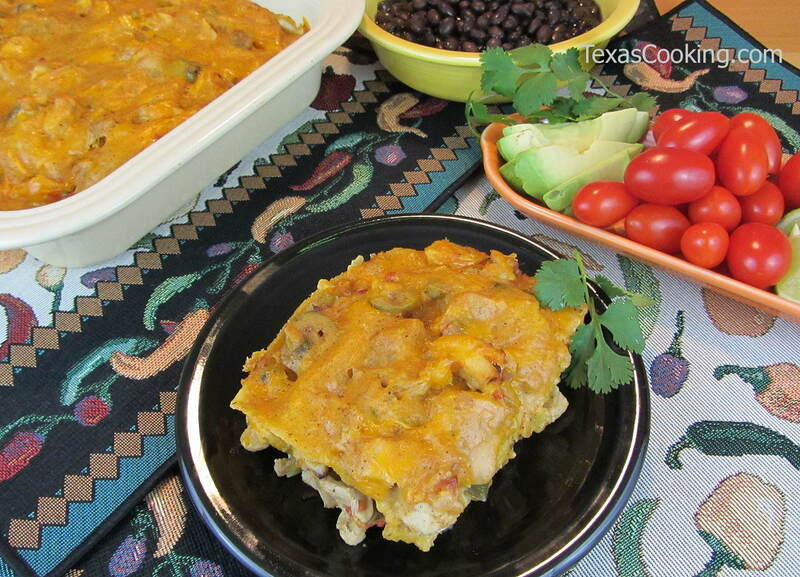 King Ranch Chicken has long been popular in this part of the country. Named for the largest modern-day ranch in Texas (although no one seems to be quite sure why -- the place runs sixty thousand head of cattle and bristles with oil wells), this dish is immensely flavorful without being highly spiced. Oh, the Southwestern flavors are there, to be sure, but King Ranch Chicken can be enjoyed by everyone, including people who think they don't like spicy food. And that brings us to the Chicken and Dumplings. It is no accident that Chicken and Dumplings has been a favorite meal for so many years. This is comfort food that is both delicious and, if you are able to take it easy on the dumplings, healthful. Our recipe calls for another boned chicken, something my mother never used in her Chicken and Dumplings, but the dish is even more delicious and certainly a lot easier to eat when there are no bones involved. These chicken dishes will do you proud, whether your dinner guests include Oprah Winfrey or just the regular crowd around your table. Even if it's Texas, is does not always have to be beef.